The rub­ber hand illu­sion is a very simple and effect­ive activ­ity. Here is a more detailed explan­a­tion of it, but the basic prin­ciple is: The par­ti­cipant sits down at a table. One of their real hands is hid­den under a box/​towel and a rub­ber hand placed in front of them. They are then being told to focus on the rub­ber hand, while the activ­ity leader brushes the same fin­ger on their real hand and the rub­ber hand sim­ul­tan­ously. We found that the best sequence was: Five brushes on the index fin­ger, five on the ring fin­ger, repeat. By this time par­ti­cipants would start to per­ceive the rub­ber hand as their real hand. At this point we star­ted to try and con­fuse their brain — we“d brush the little fin­ger on the rub­ber hand, but the index fin­ger on their real hand. This is where most faces would change into a sur­prised, slightly shocked and thor­oughly con­fused expres­sion. Amanda, who was run­ning the activ­ity, usu­ally then pro­ceeded to talk about her own Psychology research. I just told kids that this concept of body own­er­ship was the reason how anim­als knew not to eat their own limbs, and how we“d know that the pen we just picked up was a pen and not our sixth finger. What we learnt: The activ­ity is bril­liant when it works. However, very young chil­dren don“t under­stand the instruc­tions and take their gaze off if there is a lot going on around them, or if you look at them to check if they are ok. There is a trade-​​off between hav­ing it vis­ible (it really draws people in) and quiet enough. We also real­ised that the table and camp­ing chair were too high for smal­ler chil­dren, so we bought a cush­ion. The activ­ity doesn“t work for every­one and this can be a bit awk­ward after you spent so much time brush­ing fin­gers. Some kids were really disappointed. For this activ­ity we asked vis­it­ors to guess five smells. We found a bril­liant online store which sells cheap, high qual­ity degrad­able PET bottles and jars. We decided to use the blue ones to catch peoples” eyes, put a tis­sue into each (use a chop stick) and poured a bit of fra­grance into each. Then we stuck labels with the smell names on the under­side. Our smells were: Vanilla Cake Batter and Crayon from Demeter Fragrance Library, Bubble Gum and Pine from “Ancient Wisdom” and Cinnamon aroma oil. We made sure to use every-​​day happy smells (not Funeral Home!) because we did not want to acci­dent­ally trig­ger bad memor­ies. For example one of my col­leagues worked with chil­dren with burn wounds and so we decided against Bonfire. We attached a cheap white shower cur­tain to the gazebo (great because it comes with rings) and wrote the smell names on it. We then asked people to write on Post-​​Its what each smell reminded them of and stick it next to the smell. What we learnt: This is a great activ­ity in such a set­ting, as help­ers can take a couple of bottles and go out into the crowd to approach people. It works for chil­dren and adults, and few will res­ist the ques­tion: “Would you like to guess this smell?” Buy cheap shower cur­tains and table cloth weights in Poundland (obvi­ously). Bring sel­lo­tape, as sticky notes will need enforce­ment to stick (and even some people carry them away in their hair and on their back). We also real­ised that most people will phys­ic­ally touch the bottle necks with their noses,which is a hygiene issue — bring some alco­hol wipes www​.atoledo​.com and dis­in­fect bottles regularly. Mystery boxes show the power of our sense of touch. We bought cheap flat-​​pack card­board stor­age boxes, as they can be stored flat for the next event. Cut a hole in big enough for a hand and use black crepe paper as visual bar­rier, then fill with mys­tery objects. Last year we only had one box and found that younger chil­dren often were too scared, whereas older ones guessed the objects too quickly. So this year we made a “Beginner” and a “Challenger” box. Objects in the begin­ner box were: Apple, orange, rub­ber duck, spin­ning top, glasses (we used fly vis­ion glasses for addi­tional fun). The chal­lenger box con­tained: plastic frog, but­ter­fly, beetle and a plastic squishy thing with long tentacles. What we learnt: Removable lid are handy because kids can have a peek to see the objects rather than pulling each one out sep­ar­ately. Next time we“ll bring some­thing heavy to put at the back of the boxes because they get pushed behind and then push other things from the table. We wanted to encour­age people to ask ques­tions. So we put up a second shower cur­tain to cre­ate a giant white­board, labelled it with “Your Science Questions” and hung mark­ers with twine and sel­lo­tape from the gazebo in front of it. We knew we wouldn“t be able to answer all of them, but we weren“t ashamed to use smart­phone and Google to get answers to the more dif­fi­cult ones. There were not­ably a lot of ques­tions about space and the uni­verse. There were also many great ques­tions which made us learn new things too, such as: What makes bubble gum smell like bubble gum? Does Mars have weather? 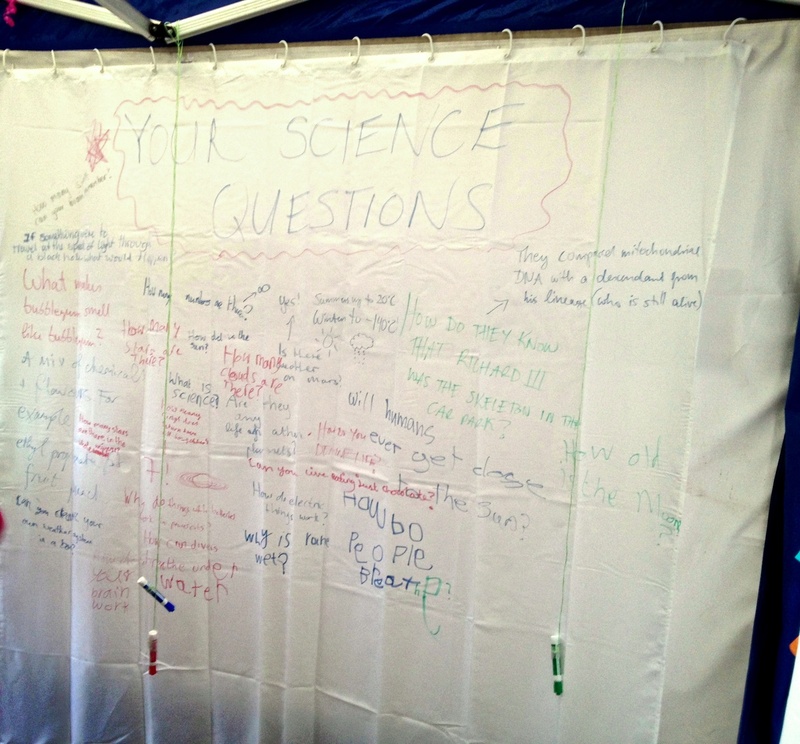 A white shower curtain makes a great whiteboard to collect science questions. As men­tioned above, what worked really well was to have a couple of people with a hand­ful of fly­ers and a couple of smell bottles stand­ing out­side of the stall. We approached people who looked inter­ested and got them to guess the smells. Each of us had an easy and a more dif­fi­cult smell. Then we swapped bottles. We dec­or­ated the entrance of our stall with bal­loons in the uni­ver­sity colours. Put candy on the table. Make sure they are indi­vidu­ally wrapped and do not con­tain nuts. — fruit sher­bets work well because they are so bright and col­our­ful. Keep the pack­aging, some par­ents want to check the ingredi­ents (allergies). Distribute your help­ers. Have some people behind the table, oth­ers in corners, so that the stall doesn“t look too crowded but that you can talk for example to par­ents wait­ing for their chil­dren to do the activity. We set up the table in par­al­lel to one of the sides. This meant that people could walk into our stall and so spend more time doing our activ­it­ies without block­ing the main walk­way outside. Have some give-​​aways. We had bal­loons and tem­por­ary insect and dino­saur tattoos. Evaluating activ­it­ies at an event like this is quite chal­len­ging. Many people just have a quick peek or only try one thing. 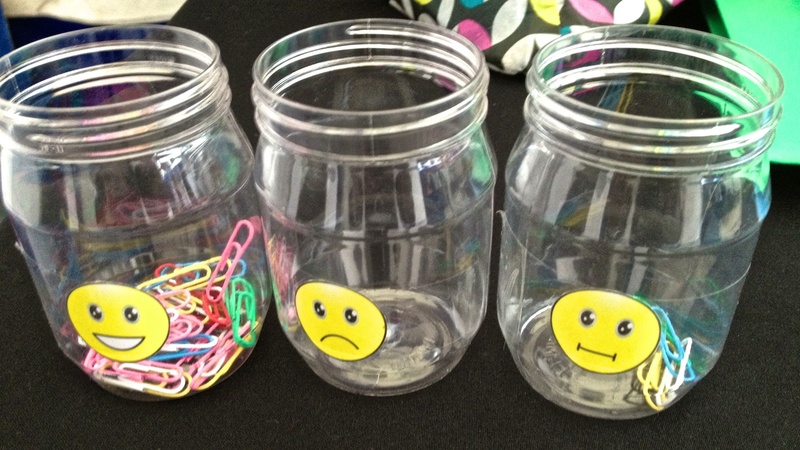 We decided to try a very basic eval­u­ation method using three plastic jars and paper­clips. I bought a jpg with dif­fer­ent emoticons, prin­ted out and stuck a happy, a neut­ral and an unhappy face on the jars (make sure to have a neut­ral mid­point). We put them on a lam­in­ated sheet with instruc­tions (“Before you leave our stall, tell us how you feel”). If chil­dren staid long and com­pleted all of our activ­it­ies, we asked them to put a paper clip into the jar repres­nt­ing their mood. What we learnt: The jars were next to the sweets, so I made sure not to give chil­dren the impres­sion that they“d get free­bies if they put their paper­clip in the happy jar. I also told them they could put it wherever they wanted and turned away when they did it. One kid asked if they could put in more than one paper­clip. Near the end our unhappy jar fell off the table and dis­ap­peared for a few minutes — talk­ing about manip­u­lat­ing feed­back! If we do it again I think it needs one ded­ic­ated per­son to encour­age vis­it­ors to use the jars before they leave. If you are plan a stall for a sim­ilar event, include a mix of activ­it­ies suit­able for vis­it­ors of all ages. We had simple explan­a­tions of the senses and the brain on lam­in­ated sheets on the table, but almost nobody looked at them (only one or two par­ents who were keen to explain it to their kids). It is more effect­ive to pre­pare a very short explan­a­tion for your each of your activities. When I atten­ded the London Science Communication Conference last year, someone stood up in the “Soapbox Session” and asked audi­ence what they remembered about their child­hood vis­its to Science Museums. The answers were: The big dino­saur skel­eton. The gift shop. Pushing ran­dom but­tons. Very few people would remem­ber actual facts, but most remembered how they felt. I think that when design­ing an activ­ity, don“t focus on deliv­er­ing facts. Instead try and cre­ate a buzz. Surprise your vis­it­ors, con­fuse them, make them ques­tion things which they took for gran­ted. Make it as inter­act­ive and hands-​​on as pos­sible. But most import­antly: Have fun, smile, talk, listen, react, joke and be relaxed.